An enormous sunspot unleashed a powerful solar flare late Wednesday (May 16), triggering a radiation storm intense enough to interfere with some satellites orbiting Earth, space weather experts said. 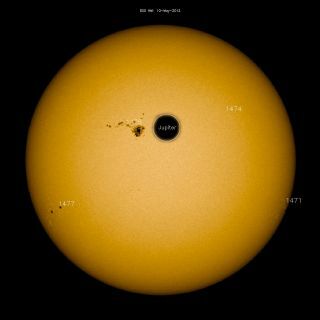 The flare erupted from monster sunspot complex AR 1476, which stretches about 60,000 miles (100,000 kilometers) from end to end, at 9:47 p.m. EDT Wednesday (0147 GMT Thursday). The flare spawned a class S2 solar radiation storm around our planet, according to the Space Weather Prediction Center (SWPC), a branch of the U.S. National Oceanic and Atmospheric Adminstration. An SWPC description classifies S2 solar radiation storms as moderate, with the potential to cause infrequent "single-event upsets" in Earth-orbiting satellites. People aboard aircraft flying at high latitudes may also be exposed to elevated radiation levels during such events. The flare also caused limited radio blackouts on the sunlit side of Earth, SWPC researchers said, adding that the radiation storm appears to be subsiding. Scientists described Wednesday night's eruption as a class M5 solar flare. Space weather researchers classifly strong solar flares into three categories, with C being the weakest, M intermediate and X the most powerful. X-class flares can cause long-lasting radiation storms in Earth's upper atmosphere and trigger radio blackouts. M-class flares can cause brief radio blackouts in the polar regions and occasional minor radiation storms, while C flares have few noticeable consequences. Strong solar flares can also supercharge Earth's auroras to create dazzling northern lights displays. Sunspot group AR 1476 was detected by space telescopes on May 5, and it fired off numerous C and M flares over the following days. It had been relatively quiet for a while, researchers said, until Wednesday night's eruption. Powerful solar flares are often associated with coronal mass ejections (CMEs), huge eruptions of solar plasma that are blasted into space at speeds of 3 million mph (5 million kph) or more. CMEs that hit Earth can wreak havoc, spawning geomagnetic storms that can disrupt GPS signals, radio communications and power grids. At the moment, however, Earth doesn't seem to be in danger of a CME impact from last night's eruption. "If a CME was launched, it is likely to be off-line with Earth given the far western site of the event," SWPC researchers wrote in an update Thursday.